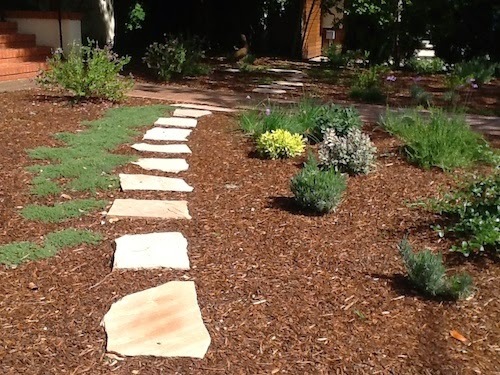 Lawn replacement rebates for homes and businesses in Santa Clara Valley have been extended at the current elevated rates through the end of 2015. This news was expected after Governor Brown's recent executive order requiring mandatory statewide reductions in water use. A kitchen herb garden replaced the lawn near the front door - my favorite lawn replacement trick! 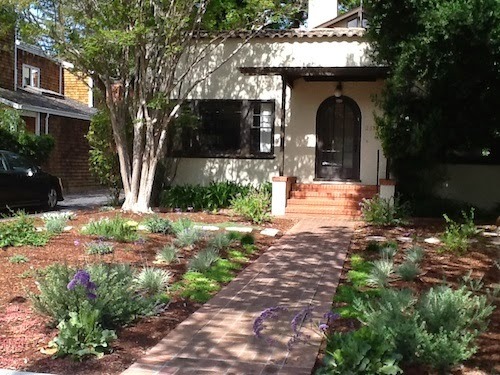 Most homeowners in the county can expect $2 per square foot of qualifying lawn (or swimming pool), and Palo Alto residents enjoy a whopping $4 per square foot ($2 of this rebate temporarily ran out at the end of last year, but has been renewed to $4). The rebate applies to currently irrigated lawns and functioning swimming pools. For details visit the Santa Clara Valley Water District website or call their hotline at 408.630.2554. Photos: A lawn replacement installed July 2014 by Jackie Marsey, Paradise Garden and Landscape, and designed by me.